Travelling by train can be one of the most alluring ways to explore Myanmar, as railway journeys often afford scenic views and chances to mix with locals that are less likely when travelling by air or bus. In upper class and overnight sleeper carriages, a sometimes more comfortable journey is possible than on buses – albeit with significantly bouncier ride than you will be used to on trains elsewhere! Taking the train is usually invariably slower than taking the bus and, for reasons that range from flooded tracks to mechanical problems, trains are also less reliable than buses; apart from the usually reliable Yangon to Mandalay express train, journey times can vary wildly. Please note that the map on this page indicates primary train routes accessible to foreigners, not all train routes. Standard sleeper: four-berth and two-berth lockable compartments, with bedclothes provided. Washbasin and toilets at the end of each sleeper carriage. Available on Yangon to Mandalay and Mandalay to Myitkyina routes. Special sleeper: self-contained compartments (maximum four people), with privacy (separate entrance, toilet, sitting and sleeping areas) but no access to the rest of the train. Water and fresh bedclothes provided. Usually only available on the Yangon to Bagan route. 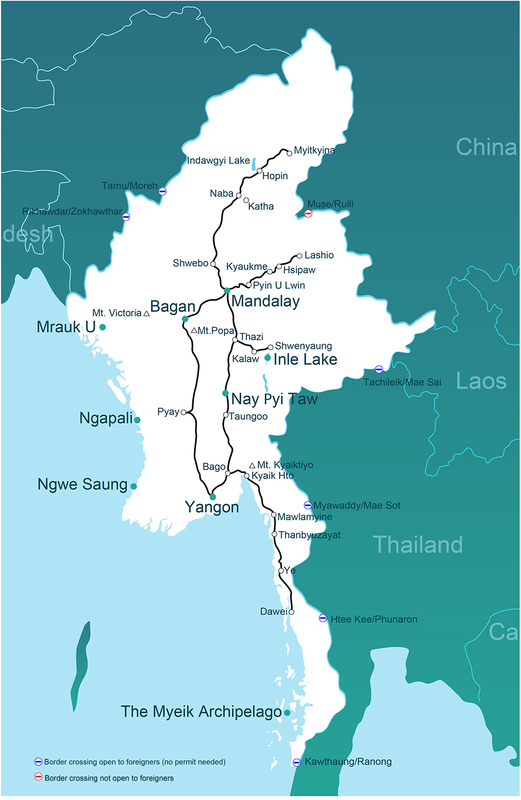 Note that, in general, train conditions on the main Yangon to Mandalay route are superior to other lines around the country: trains are cleaner and air conditioning systems are more likely to work. Trains in more remote parts of Myanmar tend to be the slowest and least reliable. We have a dedicated railway tour of Myanmar, which takes in the infamous Death Railway in the south; the Yangon to Mandalay Express; and the stunning Gokteik Viaduct in Shan State. To get in touch, go here. Train tickets from Yangon to destinations around Myanmar can be booked online here. Online bookings through this website must be made at least five days ahead of your departure date. Otherwise, tickets must be bought at the train station from which you will be departing (although in Yangon the advance booking office is separate from the main building – go to getting to Yangon for more details), and at smaller stations you may have to sit down with the station master to buy your ticket, as foreigners have to provide passport details. At railway stations, you can book tickets one day in advance for normal class seats and three days in advance for upper class seats; sleepers can be booked a week or two in advance. Seats are usually numbered in all classes – as long as you have a reserved seat, you should be able to sit down. Booking early is recommended, particularly for sleepers. At some local stations on branch lines you can only get tickets on your day of travel, but this should not be a problem for foreigner travellers. At railway station ticket offices, tickets are paid for in kyat at the same rate for everyone (in 2014, Myanmar Railways ended the price differentiation for rail tickets between Myanmar locals and foreigners; previously, foreigners paid in dollars and at a substantially higher rate). On this website, prices are listed in US dollars where it is possible to book tickets online (price includes booking fee); for journeys where we cannot make bookings online, we quote the price in kyat. Tickets range from US$10 to $25 when booking long-distance journeys online, depending on the length of the journey and the class of seat or bed (see below for more information). Buying tickets in kyat at railway stations is cheaper, costing between K1,000 and K10,000 - but we are able to offer secure online advanced booking for peace of mind and English-speaking staff who can offer detailed travel advice. To find out about trains to specific places around the country, go to destinations. As trains are unreliable, arrival and departure times can vary. Yangon station has a digital departures board (in English), but few other stations offer this facility. One of the most visually stunning journeys in Myanmar, made famous by Paul Theroux in The Great Railway Bazaar and later in Ghost Train to the Eastern Star, is this line which takes in the beautiful hill country of Shan State and the towering Gokteik Viaduct. When completed in 1900, this steel structure was one of the largest of its kind in the world and was considered an engineering triumph. It is said that repairs over the years are not what they should have been, so the train slows down to a snail’s pace when crossing the dramatic Gokteik Gorge, meaning that it is not just the stunning scenery that leaves travellers breathless! This journey has many fascinating stops, such the old colonial hill station of Pyin Oo Lwin and the rustic charms of Hsipaw. But as it is currently not possible to travel over land to/from China, unless you are heading beyond the eastern end of the line at Lashio with a special permit (for more information, go to arriving and departing over land), you will have to double back on yourself at some point. The best option is to take the bus one way, and the train the other. For a selection of photos from this railway journey, go to our Flickr photo album. Another charming Myanmar rail journey is the branch off the main Yangon to Mandalay line that veers off at Thazi, heading to Kalaw and Shwe Nyaung (for Inle Lake), and further onwards to Taunggyi, the capital of Shan State. This line winds its way very slowly through beautiful hill scenery, and is a wonderful alternative to the (much faster) bus route that most people take. It also connects travellers to two of the tourist highlights of Myanmar – the hill trekking around Kalaw and the numerous delights of Inle Lake. Check out our YouTube video of the train between Shwenyaung Junction and Kalaw - this is a fairly typical speed for a train in Myanmar!